Today, we must all remember the lives that were lost eight years ago. It was the morning that made our country stand still, come together and vow never to forget. I wrote about my experience on September 11, 2007 here. This year, my mind will still wander back to that day eight years ago, but my focus will be different. My oldest son is now in first grade. That is the age of the children that I was substitute teaching on September 11, 2007. I sat with them knowing how the world around us was changing, explaining to them the next day that their teacher was safe and trying to keep them calm. Now, I wonder about how we will explain this event to our children. How do we tell children that were not even born, like my boys, what this day was like. No doubt, they will see the haunting images from that day. Sadly, they will never know of life in the pre 9-11 days when things like traveling on planes was easier. Where were you on the morning of September 11, 2007? Did you sit in front of your television after the day trying to take it all in, or did you turn it off because you could not watch? If you have older children, how have you explained the events of 9-11 to them? I was on my way to work when I heard the news. I taught preschool and it was very challenging getting though the day. Some of the kids knew what happened, others did not. Parents were coming in talking and talking about it with no regard to how the children were taking everything in and processing it in their own ways. I will never forget one father came in hysterical because he was in the reserves and he kept saying, “we are going to war and I know I am going to be shipped out”. His son looked terrified. But, the worse thing, was being at work and thinking about all the innocent people who were killed and how many people whose lives were forever going to be changed! When I got home, I watched the news for a while. My husband was already home because all the movie studios were immediately shut down. .-= Michelle´s last blog ..Share Your Giveaways Friday! =-. I was working at the Gap, folding jeans, when the stock guys came running out of the back, telling us all to come listen to the radio, “a plane has just flown into one of the Twin Towers.” They shut down the mall, and my parents came to sit with me on a bench outside the store. We sat for what seemed like forever, and waited to hear that people we knew that worked there were safe. Aloha and take care. .-= Kiki´s last blog ..Aloha Friday – Fashion Fads =-. My husband works for American Airlines which lost two planes. Our phone rang off the hook all day long because his flights are always to New York, Boston or Washington DC. He was home that horrible day but did lose colleagues. Our children are grown but were concerned with our where abouts when they heard about NYC. My prayers go to all those who lost loved ones on this day. .-= Cathi´s last blog ..Aloha Friday – Flying =-. I was at school when i heard the news! My thoughts are with the ones who lost a loved one or a family member that day! 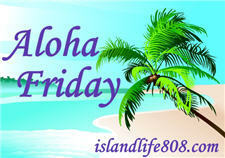 *for more ramblings check my Aloha Friday! I was living in Estonia at that time. So i was sleeping when that happened. I was at work, and spent much of the day and evening watching the news and taking it all in – in total disbelief… who would have thought that they would blow up buildings with planes???!?!?! I was an engineer on my way to work that morning when I heard the news on the radio that a plane flew into the WTC. Immediately I thought it was a terrorist attack as all cities are a “no fly zone”. When I got to work, our entire company watched in horror as the day unfolded. From there is was downhill. From that day on the company started laying off people and sent all their products to be manufactured overseas. They are no longer in business. I was a freshman in college, living away from home for the first time. It was a day to sleep in, or so I thought. A girl down the hall in my dorm was blasting the radio, and when I went down there to tell her to turn it down, I heard what was going on and ran downstairs where everyone had gathered to watch CNN. It was terrifying to be so far from home when something like that happened, and I was in the panhandle of Nebraska! I can’t imagine what those who were right there or lost loved ones felt! My heart goes out to them. .-= Andrea McMann´s last blog ..Wordless Wednesday: Where it All Began =-. I was at school teaching. hubby came in to my class to told me what happened, he was teaching at the same school but had gone home for a short time and had the TV on. i didn’t believe it. That was a very eerie day were I lived. there was no traffic on the roads, police lined the streets,No children playing outside. Cars in all the driveways at 3pm,Most people here are government workers.No planes in the air and no trains on the tracks for 24 hours. I had dropped my 3 children off at school and was inside Wal-mart picking up necessities. I was at home getting my 3 year old daughter ready for her first day of nursery school and had just found out I was pregnant. I remember watching it all in horror whenever she was in another room, but quickly changing the channel whenever she came back in. Such a sad, horrible time. I sat and watched tv without moving pretty much. Lots of crying and disbelief. When the plane was over Cleveland and headed toward PA, I immediately went to pick my kids up from school. Lots of other parents were pulling their kids out. It was horrible. Still is. I was asleep in my bed and the phone started ringing off the hook! I turned the tv on and it was just the most horrible scene. Who can ever forget it? I was getting ready for school (my senior year). My mom watches the early morning news and so we saw the second plane fly into the towers. The entire day was surreal. I was in bed, got a call from my mom–my aunty, who lived in NY and worked just 2 blocks away, called to tell her about the horrific news. I was still in a daze and didn’t really know what my mom was talking about so I got up and turned on the news. I spent all morning watching until I had to go to work–and I worked at an airline and it was nothing but chaos…. .-= SageMom´s last blog ..AF: Playing Tourist =-. I was at work but I listened to the radio host report that I plane crashed in New York City, then that it hit the towers and then another… and I just listened as the day unfolded. After I was off work I was in our new home we just bought and we live near an air force base. They sent out on of their big jets and it set of a huge boom sound that scared me like never before. I will never forget that moment or the rest of the day as long as I live. .-= Nina´s last blog ..CAKE DECORATING =-. .-= Thom´s last blog ..What Does Your Eye Color Say About You? and Some Jokes =-. I was in the dorms in my freshman year of college. I got really mad at my mom for waking me until I found out what happened. I didn’t have a TV in my room so I got most of my news on the internet. I was at work that morning. We all sat in the waiting room with our customers and watched the news in horror. Later that night and for awhile every night I watched and listened to people share their stories. There were definitely times that I did turn off the TV. I am really sensitive and have a hard time taking in such emotional things sometimes. I don’t know what I’ll say to my sons when they ask me about that day. I guess I am lucky that I have more time to think about it. .-= Kimberly@PrettyPinkMomma´s last blog ..Aloha Friday – Mascara Wars =-.